The 9mm Luger is a great high-volume shooting cartridge thanks to its low recoil and low price. 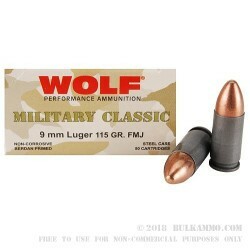 Drive your costs down even further with this Wolf ammunition, which produces familiar ballistics with a 115 grain bimetal jacketed bullet. These rounds produce good accuracy at typical pistol ranges and use a standard pressure load suitable for subcompact carry pistols like the SIG P938, Glock 43, and Ruger LC9. This ammo is loaded in Russia using non-corrosive Berdan primers. Its most distinctive feature is the polymer-coated steel cases that help make it one of the most affordable choices on the market. The polymer coating ensures reliable cycling and ejection. Note that this ammo's steel components give it magnetic properties that may make it unsuitable for some indoor ranges. Check with your range if you're unsure about their policies.